Tinuku - SpaceX, Elon Musk’s space transportation company, on Monday named its first private passenger on a voyage around the moon as Japanese billionaire Yusaku Maezawa, the founder and chief executive of online fashion retailer Zozo. A former drummer in a punk band, Maezawa’s moon flight is tentatively planned for 2023 aboard SpaceX’s forthcoming Big Falcon Rocket spaceship, taking the race to commercialize space travel to new heights. The first person to travel to the moon since the United States’ Apollo missions ended in 1972, Maezawa’s identity was revealed at an event on Monday evening at the company’s headquarters and rocket factory in the Los Angeles suburb of Hawthorne. “He’s a very brave person to do this,” Musk said. Most famous outside Japan for his record-breaking US$110 million purchase of an untitled 1982 Jean-Michel Basquiat painting, Maezawa said he would invite six to eight artists to join him on the lunar orbit mission. The billionaire chief executive of electric car maker Tesla Inc, Musk revealed more details of the Big Falcon Rocket, or BFR, the super heavy-lift launch vehicle that he promises will shuttle passengers to the moon and eventually fly humans and cargo to Mars. The BFR could be conducting its first orbital flights in about two to three years. Musk had previously said he wanted the rocket to be ready for an unpiloted trip to Mars in 2022, with a crewed flight in 2024, though his ambitious production targets have been known to slip. “Its not 100 percent certain we can bring this to flight,” Musk said. The 42-year-old Maezawa is one of Japan’s most colorful executives and is a regular fixture in the country’s gossipy weeklies with his collection of foreign and Japanese art, fast cars and celebrity girlfriend. In a country known for its staid corporate culture, the businessman is one of a small group of founders widely recognized by the general public - with others including SoftBank Group Corp’s Masayoshi Son and Fast Retailing’s Tadashi Yanai. With SpaceX, Amazon.com founder Jeff Bezos’ Blue Origin and entrepreneur Richard Branson’s Virgin Galactic battling it out to launch private-sector spacecraft, Maezawa will join a growing list of celebrities and the ultra-rich who have secured seats on flights offered on the under-development vessels. Those who have signed up to fly on Virgin Galactic sub-orbital missions include actor Leonardo DiCaprio and pop star Justin Bieber. A 90-minute flight costs US$250,000. Short sightseeing trips to space aboard Blue Origin’s New Shepard rocket are likely to cost around US$200,000 to US$300,000, at least to start. 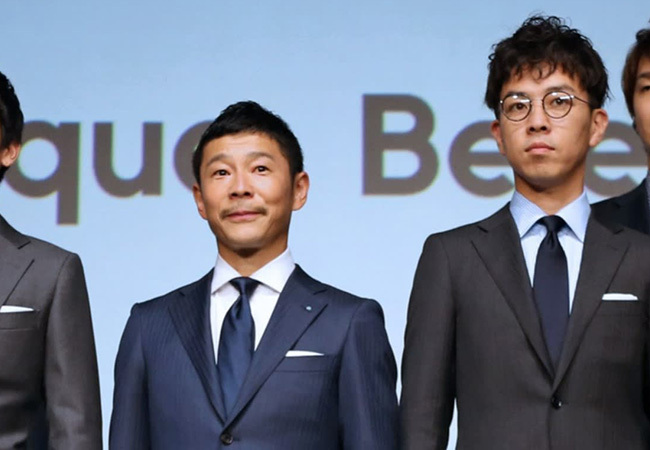 Maezawa has already shown his penchant for fast machines, splashing out on vehicles including the Bugatti Chiron sports car and the Mercedes-Maybach G650 Landaulet SUV. And last month he tweeted that his new jet’s interior is being fashioned by luxury label Hermes. A jaunt around the moon will provide welcome publicity for his company Zozo, which has ambitious overseas sale targets to be driven by its custom-made private clothing line. The company’s shares fell as much as 4.7 percent after the news before recovering. SpaceX has already upended the space industry with its relatively low-cost reusable Falcon 9 rockets. The company has completed more than 50 successful Falcon launches and snagged billions of dollars’ worth of contracts, including deals with NASA and the U.S. Department of Defense. When asked about Boeing Co’s CEO Dennis Muilenburg’s prediction that the first humans will be carried to Mars on a Boeing rocket, Musk responded, “Game on,” to the sound of cheers from employees assembled at the event.